Da Leone's hip designer furnishings and clean lines are a bright surprise within one of Rome's old palaces in the heart of the Historic Centre, "Il Centro Storico" of Rome. Leave your door and enter into the beautiful and chic Piazza San Lorenzo in Lucina, one of Rome's historic Piazzas, and just a short walk to the Spanish Steps (yet your apartment is peaceful). You will be walking distances to all the major sites, plus Via Condotti shopping, great restaurants, gelaterias, cafes, bars and intimate trattorias. A wonderful outdoor market is an easy walk away for daily shopping of the freshest fruits and vegetables imaginable. Live a real Rome experience. Just off the Piazza Lucina on the first floor of this 17th century Palazzo is this spacious and elegant 110 sq.mt. two bedroom apartment with living room, plus separate kitchen with dining area seating 4. Large double-glazed windows provide both silence and plenty of light. A beautiful new bathroom with roman tiles, and bright modern kitchen complete the picture. Modern furnishings create tranquil surroundings. 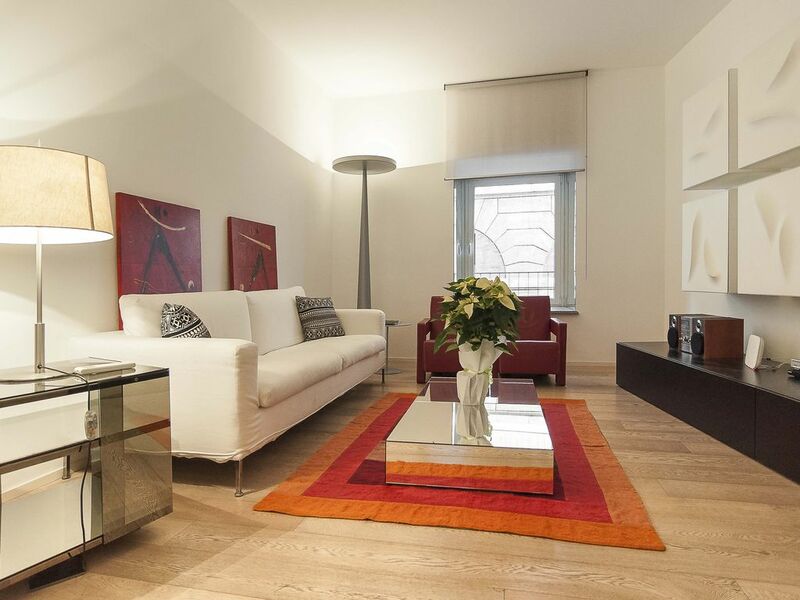 A short walk to Spanish Steps, shopping, museums, and Metro stop makes it an ideal location. You will love this tastefully restored apartment in a modern idiom "a la Philippe Starck". It is approximately a 5 minute walk from "Spagna" Metro station (at "Piazza di Spagna", line A), 7 minutes walk to Piazza Navona, the Pantheon and just over 20 minutes walk to the Vatican. A €130 end-clean charge is added to all rentals. Additional cleaning available on request. Rates for longer stays available on request. Accidental Rental Damage Insurance is required for all reservations (€59 for up to €1000 of damage). A 50% deposit payable by bank transfer is due at time of booking to confirm the reservation. The balance is due 60 days prior to arrival. If booking is made within a 60 days of the arrival date, 100% of the rental due is required to secure the booking.